National Museum of Catalan Art in Barcelona city is a must see place during your holiday. It's abbreviated as MNAC and located at Montjuic hill in Barcelona. National Art Museum of Catalonia presents its visitors collection of romanesque church paintings. 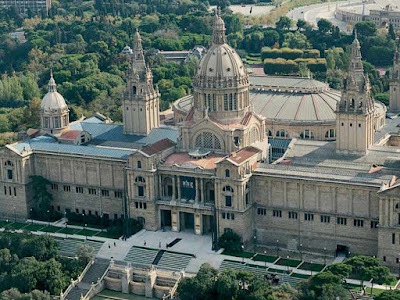 The museum is inside Palau Nacional which was announced as museum in 1990 and it is one of the biggest museums in Barcelona. Museu Nacional d'Art de Catalunya hosts many pieces of art of Catalan or Europe. You can see the examples of Romanesque, Gothic, Renaissance and Baroque style. You can arrange a day to visit National Museum of Catalan Art especially if you cannot do anything outdoor. It may take a day to see the museum as there are many pieces of art to see and also a pool, restaurant,art of library and shops. So you can choose your ticket per day or two days as outside of the museum has perfect scenery for professional photo shooting. There is a hall on the top of the museum and many magnificent concerts are performed here. At nights,beautiful light and water show take place at MNAC. Please check the official web site whether the show is on or not in winter. In the musuem there are sofas for visitors so you can have a rest when you get tired as the museum is so big. Beside the museum, you can go up to top and enjoy the city view by passing Plaça de Espanya and magical fountains and using elevators. You will come across with street musicians. I guarantee that you will go somewhere else when you hear the music. Here below you can find opening hours and days of MNAC. Mondays closed, except public holidays. Monday public holidays 2016: March 28th, May 16th, August 15th. The entrance ticket is 12€ for National Musuem of Catalan Art and valid for 2 days during a month from the purchasing date. You can get a card for 6 museums entrance at a time so it can be cheaper. 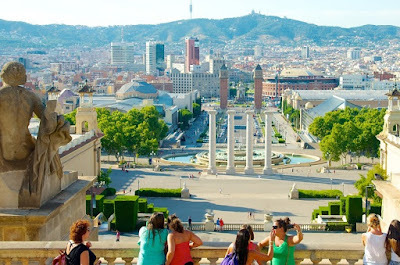 For Barcelona Travel Tips please click. There are also temporary exhibitions at the museum and you need to get ticket for these activities but the prices are generally between 4 and 8€. For the rooftop view you should also pay extra 2 €. In Barcelona Travel there are lots of museum options as you see. Please follow us for more museums in Barcelona city so that you won't regret when you go back your hometown as it is not possible to miss out a tourist attractions in Barcelona city with our guide. I hope you will enjoy National Museum of Catalan Art. L’art romànic al MNAC from Barcelona Cultura on Vimeo. Thanks for the video and please contact for any copy violations.